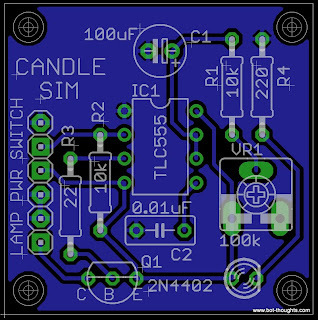 The candle is based on a 555 timer IC in monostable (aka one shot) mode. When the 555's trigger (TR, pin 2) goes low, the 555's Q output (pin 3) goes high for a set period of time, then goes low again until the next low TR. 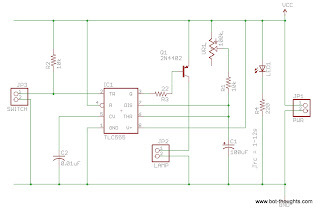 The Q output drives a PNP transistor so that the candle (a small incandescent lamp) is normally on. The time period that Q goes active is based on the time constant of an RC network: R1+VR1 between Vcc and DIS/THR (pins 6 & 7) and C1 between DIS/THR and ground. I wanted a time range of about 1-10 seconds so I used Electronics Assistant to calculate some possible values and came up with 10k + a 100k potentiometer along with a 100uF cap. Besides the basics, tie reset (R, pin 4) high, wire up ground and Vcc, and throw a 0.01uF cap from CV to ground. The trigger input is tied high and grounded with the wind detector switch. The lamp runs off two AA batteries so I chose a TLC555 CMOS IC I had on hand because it will run off a Vcc as low as 2V. 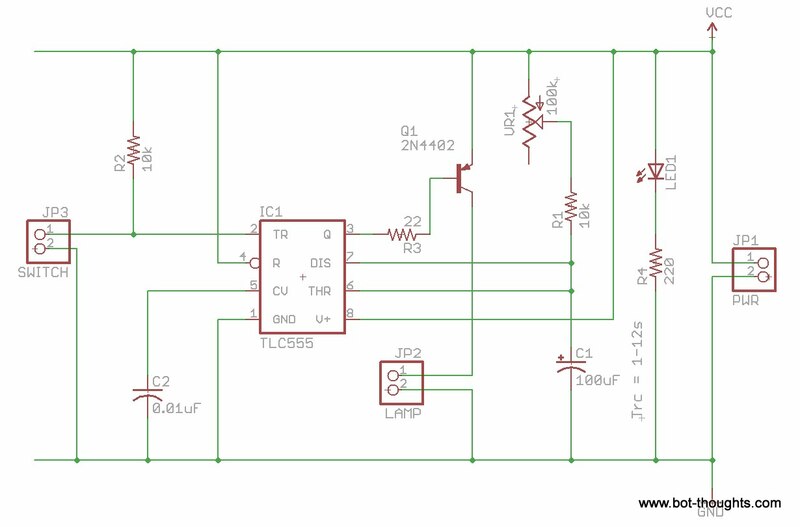 Here's the simple 1-layer PCB design. I etched the board at home and you can too. I prototyped the circuit on a breadboard before finalizing the board and etching it. I made sure it worked and the timing was close enough. 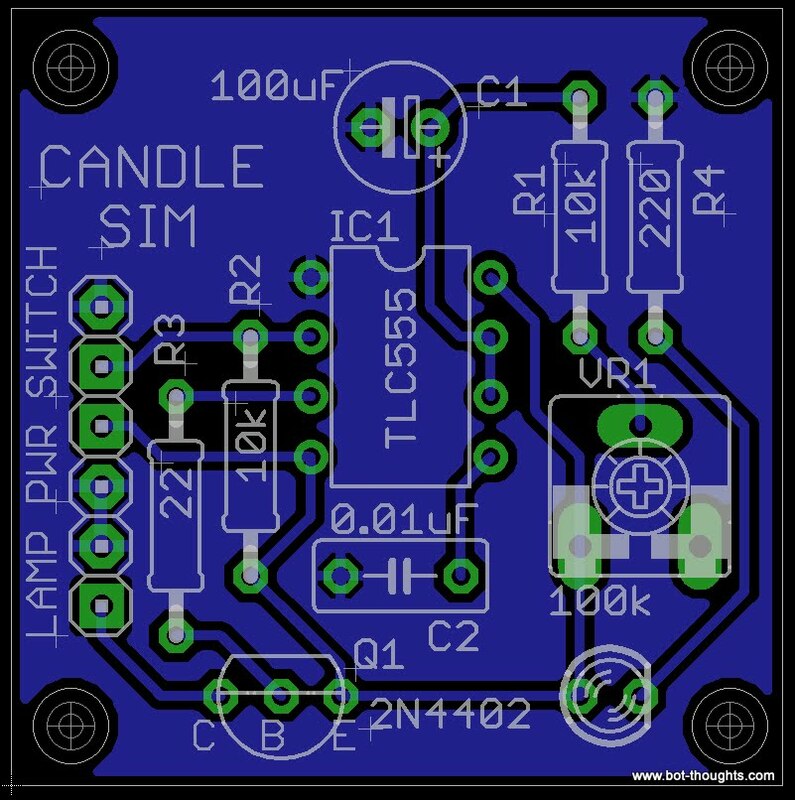 The PNP is a 2N4402 BJT, 600mA capacity, plenty for the lamp. I chose the base resistor with a combination of back-of-napkin calculation, LTSpice simulation and breadboarding experimentation. The transistor doesn't get warm and the lamp is bright so the BJT is probably in saturation. Or close enough. This isn't a mission critical application, after all. The wind detector is basically a custom mechanical switch that is normally open and momentarily grounds the 555's trigger pin, which is pulled up high with a resistor. One half of the switch consists of a stiff piece of paper about 2"x2", taped to the switch lever, which is a length of 0.032" music wire with a spring on the other end and a loop for mounting. The other half of the switch is a J shaped piece of wire mounted so the lever can bump into it when the wind catches the paper and moves the lever. I made the candle base out of some scrap wood with a hole in the bottom to hold the circuit board. A section of 3/4" square dowel mounts to the base. A lamp socket mounts to the top of this dowel. The lamp sits at a regulation 15-20cm height. A piece of brass bent in an L shape holds the AA battery holder to the side of the base. Wires route into the base from the back. That's all there is to it. Just plug in the battery, the lamp comes on. Just a little airflow from you or a robot blows out the lamp for several seconds then it lights up again.